The Member Musings section of our blog is written by church members in the hope of encouraging you to see all of life through the lens of the gospel. Today we hear from Jenn Chen as she goes back to school to study biblical counseling. In May 2014, I printed out my syllabi for two classes. Yes, I’m going back to school! Because of God and his grace in my life. When we first attended Lighthouse back in the summer of 2011, I saw a church pamphlet that stated “We believe in Biblical Counseling”. My limited exposure to Biblical Counseling was in my “Introduction to Integration” (integration of theology and psychology) class. It was given a brief mention in lecture, critiqued as narrow and over-simplistic or even worse, as harmful to the counselee. And it doesn’t involve science (which psychology reifies)! So I wondered if Lighthouse was the right place for our family, even to the point of discussing it with a fellow Christian psychologist. She encouraged me not to let it stop us exploring Lighthouse. Though I was unaware at the time of any Christian convictions against psychology, I could sense some discomfort at times when people would hear my answer to “what do you do?” (I get that anyways, but in secular settings, I get more “So can you read my mind?” or “So are you analyzing me right now?” discomfort). However, Peter and I felt like we were really growing from the teaching in Sunday sermons, and continued to come to Lighthouse. Then God created the perfect storm in my life: severe illness with accompanying panic attacks, no church home, awareness of myvery limited faith. Everything I knew was not working, including therapy techniques. In desperation, I signed up for Biblical Counseling at Lighthouse. And through this, God showed me the core of “issues” I have been struggling with my whole life: my kingdom of shame, control, and fear. He began to show me his kingdom of righteousness, peace, and joy (Romans 14:17). I began learning the sweetness of his Word of life and Biblical Truth. He began to turn my heart of stone into a heart of flesh (Ezekiel 36:25). I could go on about how God continues to transform me, but that would be a digression for this blog. I began to read everything I could put my hands on about Biblical Counseling, and even took a class The Dynamics of Biblical Change through CCEF (Christian Counseling & Educational Foundation – go to CCEF.org for great resources), an online campus related to Westminster Seminary. Through my own Biblical Counseling and through reading and class, I became aware of the untruths I had learned in my schooling. In seminary, theology had been difficult for me. In a postmodern era, I became very confused about truth – I began to think it was unknowable, because doesn’t everyone come from a subjective place? And to claim absolute truth can be arrogant and inflexible – no one wants to be either of those. Theology seemed like an ivory tower pursuit that did not pertain to my daily life, so I thought, let the theologians battle it out with each other. But Biblical Counseling is applied theology. As Pastor Kim says, what we believe about God affects how we live our lives. And Scripture is filled with knowable truth, especially the life-changing truth of the gospel, not just for our eternity but for each moment in this life. Also, I had been taught that the Bible addresses issues of ultimacy, while psychology addresses issues of finitude. In non-academic language, this means the Bible addresses our ultimate state (our eternity) of being, while psychology deals with our day to day life here on earth (what will end). And as a therapist, we should direct counselees to pastors for issues of ultimacy. Thus, therapy didn’t need to explicitly deal with Scripture, nor did Scripture necessarily entail the answers to psychological questions. At one point, I posited that Scripture told us how we should be ideally, but not how to get there (change our behaviors or hearts). In addition, somewhere I learned that by being a Christian, I was bringing the Holy Spirit with me into the therapy room, which implicitly made my therapy Christian. I also thought that by bearing another’s suffering, I was acting on a theology of presence in suffering just as Christ bore our suffering. Also in reading literature on Biblical Counseling, I realized that in a sense, as a Psychologist I work as a “secular clergy”. A church has theology based on its leadership’s understanding of the Bible, of people, and of suffering, which affects that church’s ministry to suffering people. A therapist can also serve as a “priest”, listening to “confessions” and administering “wisdom” and how to deal with suffering. In fact, the word patient comes from Latin as “one who suffers”. Interestingly, prior to the illness that brought me to Biblical Counseling, I had been working on a book on the latest psychotherapies. I was laying out how each therapy viewed etiology (cause of the problem), its philosophical underpinnings and assumptions (worldview and view of sufferers), and techniques (how to solve the problem). Biblical counseling speaks to the idea of instead of taking secular therapies and trying to adapt them for a Christian, starting from the beginning with a Christian worldview of the problem and a scriptural solution. I have been able to use some of what I have learned about Biblical Counseling with some of my Christian patients and have been blessed to see heart changes. One woman with bipolar has become less reactive – in situations which she would have cursed people out, she has been able to stop and bless them. Another woman who would isolate for days in her room with depression has joined her beginning believer’s class at her local church even though she has been attending there for years. I have also come across challenges, which has caused a deeper desire to learn even more about Biblical Counseling. When I originally went to seminary for Psychology, I thought I was going to learn how to minister to others through my faith. I learned about how my faith would “inform my practice”. Today, I am going back to school for the gospel and my faith to be my practice! 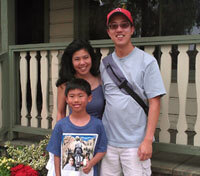 Since joining Lighthouse, Jenn Chen has a gained a heart for the gospel and for the Word. She has always had a passion for culture, the brokenhearted, and for her husband Peter and son Garret. She loves spending time with Lighthouse family and the Spectrum International Student ministry. Other interests include reading, dancing, baking (and eating), reading, God’s creation outdoors, stand-up paddleboarding, and studying (reading). If you would like to leave feedback on any of our blog articles, please contact us at blog@lighthousesouthbay.org.